Are you there? Share photos and video, but stay safe. 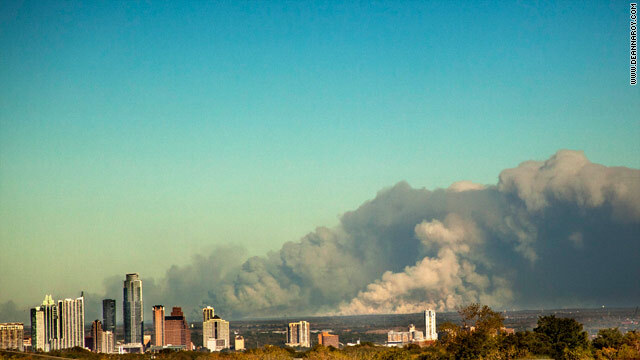 Bastrop, Texas (CNN) -- A raging wildfire near Austin, Texas, killed two people, officials said Tuesday, as firefighters fought to gain the upper hand against flames, wind and fatigue. The deaths raise the overall toll from the outbreak of fires to four lives lost. A wildfire killed a woman and her 18-month-old child Sunday when flames engulfed their home near Gladewater, officials said. "Texas is in a difficult situation right now, and our priorities are pretty simple. No. 1 is to protect life at all costs," said Nim Kidd, chief of the state Division of Emergency Management. The Texas Forest Service said it has responded to 181 fires that have burned more than 118,400 acres over the last week. The fires have destroyed more than 700 homes since Sunday, according to the forest service. More than 1,000 homes have burned in the state since fire season began in November, Gov. Rick Perry's office said. Winds that had peaked at nearly 30 mph had calmed to little more than half that Tuesday, giving firefighters a bit of a break. "It's been a little calmer today," Mary Kay Hicks, a forest service official, told CNN's "AC 360." "The wind has really died down and helped us get more of a handle of what's going on out there," she said. The largest fire, near Austin, has spread across 30,000 acres, destroying more than 600 homes and forcing the evacuations of at least 5,000 people, officials said Tuesday. Known as the Bastrop County Complex, the fire has burned largely uncontrolled since it began Sunday afternoon. The two people killed by the blaze near Austin were not public safety personnel, according to incident command officials. The officials declined to offer details. The danger from a fire near Houston -- called the Magnolia fire -- appeared to be lessening for the most populated areas. Officials in Harris County, which includes Houston, said the fire was no longer a threat there. Also, many residents were being allowed back into their homes Tuesday in neighboring Montgomery County. About 4,000 homes in Montgomery had been evacuated, according to Lt. Dan Norris of the county's emergency management office. Firefighters continued to battle hot spots in Montgomery, but the bulk of the problems from the Magnolia fire appeared to be centered in Waller and Grimes counties, Norris said. Another blaze in Grimes County, the Riley Road fire, has destroyed 20 homes and has hundreds more in its path, the forest service said. It had burned 3,000 acres as of Tuesday, according to the forest service. Two major fires in Travis County destroyed 44 structures and damaged 74 others, Roger Wade, a spokesman for the Travis County Sheriff's Office, said Tuesday. Authorities allowed residents of the Steiner Ranch area, burned by one of those Travis fires, to return to their homes Tuesday afternoon. Nichelle Bielinski was one such resident. Standing amid the ruin of her two-story house, where smoke was still rising, she took stock. "I'm OK," she said. "I am the luckiest person in the world. My family is safe." Four firefighters working the Magnolia fire were taken to a hospital for treatment of heat exhaustion, according to the Montgomery County Office of Emergency Management. One also had an ankle injury. All injuries were minor, the agency said. The Bastrop County fire started Sunday and spread quickly Monday on winds fueled by what was once Tropical Storm Lee. As the fire spread, firefighters would leave one structure thinking it was safe to work on another, only to return and find the first building had burned, said Tim Simpson, a firefighter deployed to Texas from Johnsondale, California. "We were doing everything we could," he said. Firefighters accustomed to attacking a fire head-on could do little more than pick around the edges, trying to protect whatever they could, said Tom Boggus, director of the Texas Forest Service. "We've been very defensive. It's all we could do until now," he said. The historic drought in Texas has created ideal conditions for the rapid spread of wildfire. So far in 2011, 7.2 million acres of grass, scrub and forest have burned in wildfires nationwide. Of those, some 3.5 million acres -- nearly half -- have been in Texas, according to Inciweb, a fire-tracking website maintained by state and federal agencies. Tuesday marked the 294th consecutive day of wildfires in Texas, according to Inciweb. More than 2,000 firefighters are working fires across the state, Boggus said. Fatigue is a major issue, he added, especially for volunteer firefighters from local departments who form the backbone of the response. Boggus said Texas officials are seeking additional resources from around the country to help battle the fires. CNN's Jim Spellman, Chris Welch, Melanie Whitley and Rich Phillips, and journalist Jocelyn Lane, contributed to this report.